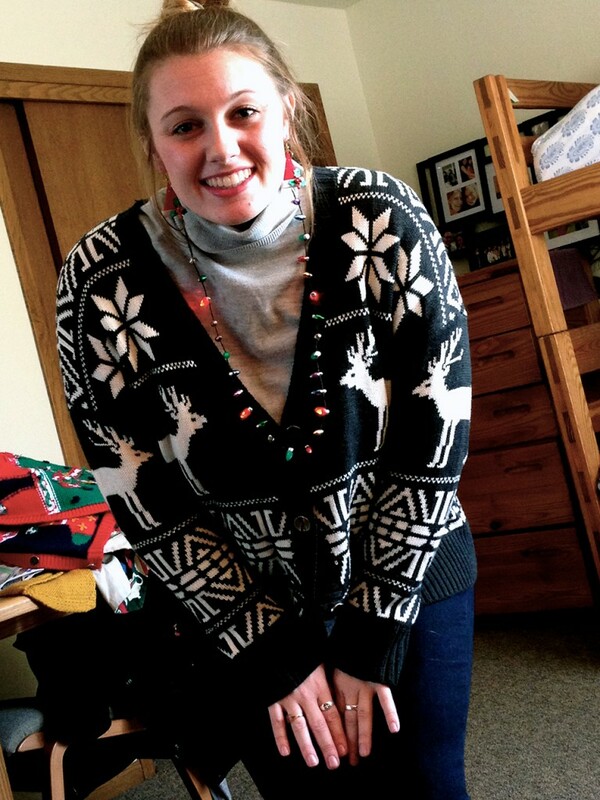 Junior Kate Bjelde, a self-proclaimed Christmas enthusiast, has created a tradition for herself to wear a different Christmas sweater for each of the 25 days leading up to Christmas, including Christmas Day. Submitted photos. 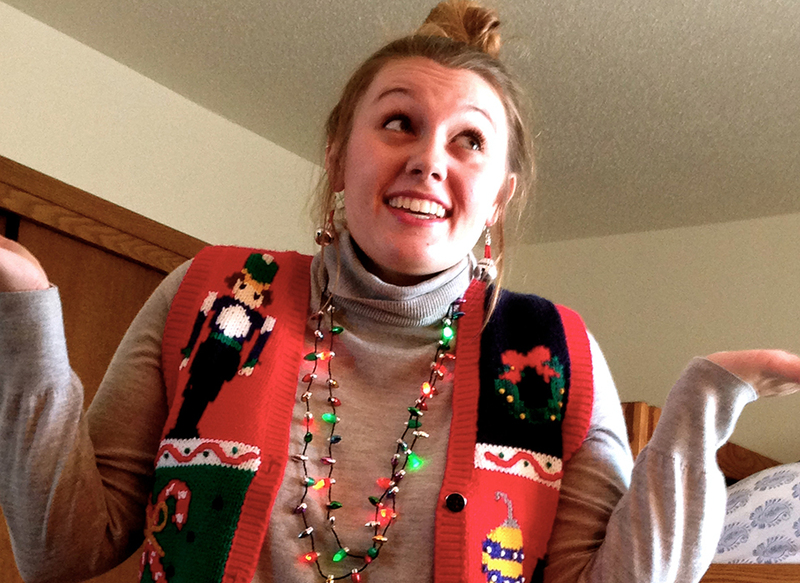 It kicked off Dec. 1 with a quotation and a sweater, and each year it continues for 25 days. Katie Bjelde, a junior at Concordia, transferred from Lake Forest College in Illinois this year. With her, she brought a closet of sweaters. Dec. 1 marked the beginning of a tradition for Bjelde, a tradition now in its third year of existence. 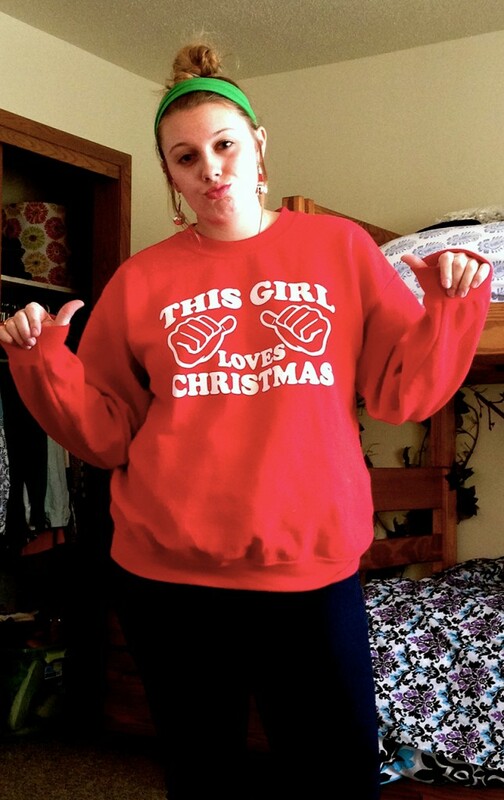 She is a self-proclaimed Christmas enthusiast and takes sharing the Christmas spirit to the next level. Growing up, it was no secret Bjelde loved Christmas. In middle school she began handing out 60-day Christmas countdowns to classmates to help get them in the spirit. When she got to her senior year in high school, her mom thought it was time for her to create a trademark of her own for people to know her by, to emphasize her holiday spirit. Bjelde and her mother took a trip to Savers to begin looking for that special Christmas touch Bjelde could carry with her. They searched through the store, finding a few Christmas baskets and ornaments that showed little promise. Bjelde remembers her mom looking over the potential purchases and saying that they just “weren’t (Katie),” Bjelde said. Her mom turned her loose in the store, and Bjelde sifted through the clothes until she hit the jackpot: Christmas sweaters. “It was the perfect amount of tacky and fun,” Bjelde said, referring to the first Christmas sweaters she found on the clothing rack. From there, her collection flourished. She began with just five sweaters, until it grew to the 32 she keeps in her closet today. She gets them from Savers, Ragstock and her grandma’s closet. After returning from Thanksgiving break this year, Bjelde brought back 15 sweaters to be worn for each remaining day of the semester. 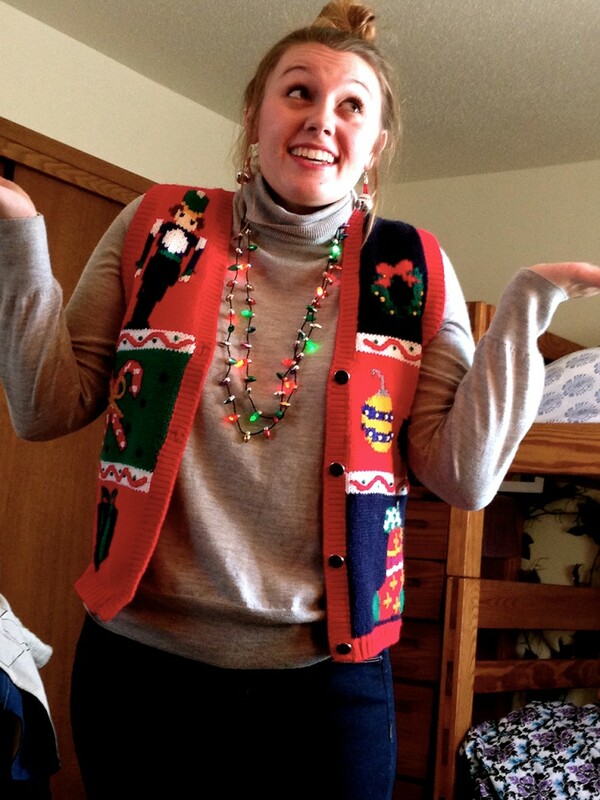 While there are more than 15 total days left of the semester after Thanksgiving, Bjelde took into account the days she would not be able to wear the sweaters because of the Christmas concerts, lowering the number of sweater days to 13. Bjelde brought the extra two sweaters knowing that friends would want to borrow some throughout the holiday season. When it comes to her Christmas sweaters, she plays favorites. A few years ago, Bjelde received a blue sweater from one of her cousins. But this is not just a plain blue sweater — it is complete with bears stitched into the front with battery-operated, light-up eyes. Although scary to some, Bjelde likes to pair it with light-up earrings and bracelets to make it the perfect amount of tacky. “It’s so terrible that I love it,” she said. She said it is her favorite sweater, both because of the uniqueness of the light-up eyes, but also because of the complete accessory ensemble that goes along with it. The outfit is just a small representation of Bjelde’s spirit. “I just love everything about the Christmas season, from the smells … to going outside and having it be snowing and just terrible weather but loving it at the same time,” she said. But her favorite part of Christmas is how everyone is their better self, Bjelde said. Bjelde said she thinks the overall cheeriness begins at Thanksgiving and only grows from there. From an early age, she was encouraged to share her spirit. Her mom, in addition to helping find her signature look, made reindeer mix every year: a plastic bag filled with oats, glitter and one reindeer sequin. Then on Christmas Eve, the kids would go out and sprinkle the mix on the front lawn, alerting the reindeer to stop at their house. Since then, Bjelde has continued making the mix each year and hands some out to her friends and classmates. With a little twinkle, each bag spreads her Christmas cheer.